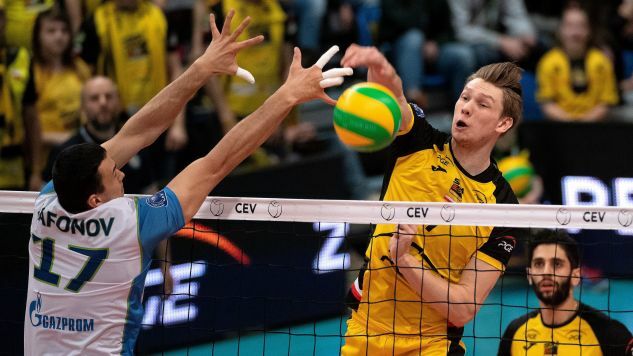 Although PGE Skra Bełchatów lost in an away game against Zenit Petersburg 1:3, the Polish side won the decisive, Golden Set 15:11, and made it to the semifinals of the CEV Champions League on Wednesday. After defeating Zenit 3:1 in the first match of the quarter final at home, Skra had to win at least two sets, or, in case of winning only one, achieve victory in a last-resort Golden Set, played to regular tie-break rules (to 15 points, and with at least a two-point advantage). However, the task was difficult. This time, one of the rivals’ best players, the Cuban Oreol Camejo was declared fit to play, as his absence in the match in Poland was clearly seen. Zenit had proven many times that it plays amazing volleyball in front of the home crowd, and further evidence could be seen on Wednesday evening. Skra put up a fight, but it was not enough to stop Georg Grozer, the German attacker from the host’s team, who scored an astounding 28 points. The aforementioned Camejo was the second-top player with 17 points, and much to their effort and good serving Zenit won the game 3:1, and the Golden Set was needed to determine who will play in the semifinals. In the decisive part, it was Skra who built the advantage thanks to a four-point tally, and it was 6:11. When the hosts nearly caught up, and the result was 10:11, it could have been a harbinger of a thrilling end. Fortunately for the Polish side, they scored three points in a row, including two crucial blocks, and they had four match points. Zenit managed to defend only one of them, thus Skra Bełchatów emerged victorious and eliminated the Russian team from the competition. Wednesday’s game was not the only quarter final where the Russian and Polish sides met. Trefl Gdańsk, after a home 2-3 defeat, went to Russia to face Zenit Kazan, the current title holder. The hosts had completely dominated the Champions League, winning it four times in a row over the years 2015-2018. Yet, the ambitious Polish team, who do not perform well in the national league (currently tenth place), shocked the Russian giant by winning two sets. The sensational qualification was just at arm’s length, but, after the initial shock, Zenit won the next two sets, and it was clear that Trefl needed to win in the tie-break to keep their dream alive. In the fifth set, the players of Trefl Gdańsk regained their composure and won 17:15 the tie break. Just like in the match between Skra and Zenit Petersburg, the Golden Set was needed to settle the score. Then, the more experienced team from Kazan showed their cold blood, and built the advantage in the final stage of the set, to which the Polish side ultimately could not catch up. The title holder won 15:12, but as a consolation prize, Trefl Gdańsk has ended Zenit Kazan’s unbelievable streak of 30 straight wins in the Champions League competition. PGE Skra Bełchatów is an eight-time Polish Champion. They have won one silver and two bronze medals in their history of starts in the CEV Champions League. As not every quarterfinal has been settled, Skra does not know its rival yet.